Hello and Welcome, David Judge here and today we’re going to discuss SEO Penalties. 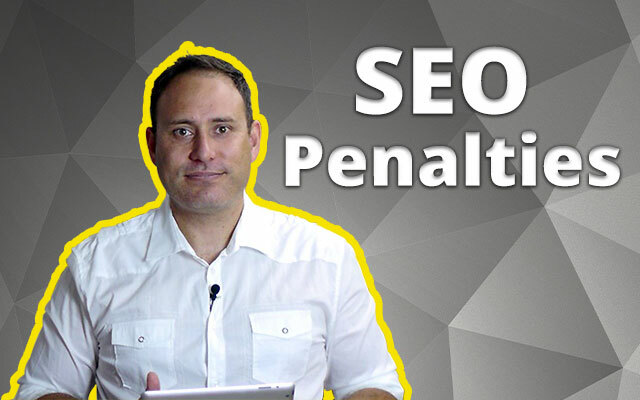 We’re going to talk about the idea of what an SEO penalty is, the different types of penalties, and what you can do if you’re penalised. So Let’s jump in as this is a really juicy subject. An SEO penalty is when your site goes against the webmaster guidelines of a search engine (specifically Google in today conversation) and as a result loses it’s search engine visibility. In plain english, this means your site loses its rankings. There are 2 ways a penalty can occur… a Manual penalty, where a human finds an area of your site violates their guidelines and pushes the big red button of doom or Algorithmic which is when Google’s algorithms (their computer language) picks up an area and algorithmically penalises your site. If you think you have a penalty, the first step is to check and find out. If it’s a manual penalty Google will tell you if you install a handy little add-on called ‘Google Webmaster Tools’. So you can see a variety of penalties here, which as I said are manually activated. The most common manual penalty you would find was related to the types of links you have pointing back to your site… more about that in a minute. There are also algorithmic penalties which occur when Google roll out a change on how they measure the elements of a quality site. When these occur you’ll normally notice a change in the traffic that is coming to your site from Google. Google’s algorithm (the way it chooses which websites rank where) is so huge and complicated that they broke it into a few different areas to allow people to focus on specific areas of improvement. They’ve also given these different areas of their algorithm cute animal names to lead you into a false sense of security as they pounce and attack your site. You may or may not have heard of these animals so we’ll share each one and what purpose it serves within the overall algorithm. So first is the Panda – This was the first of the 3 animals that measure your websites content, the quality of that content, as well as the structure of that content. Panda has always focussed on understanding how well your content relates to the words you would like to rank for and is constantly improving how it measures the theme and structure of your website. Of all of the algorithms Panda is one of the most overlooked as most people are missing out on massive opportunities to improve this area of their online presence. The next is the Penguin – Penguin is all about links that point back to your website and is an area a lot of SEO’s have focussed on as it was the most widely abused techniques people used to get websites ranked. Google have always reinforced that someone linking to your website should be to pass value onto that visitor and of the examples I showed before the most common reason was due to spammy links. We’ve had to work with a number of clients to correct issues with Penguin and the most common type of spammy links were an SEO person arranging 1000’s and 1000’s of links from directory sites and any other site they could find to get a backlink. When businesses find their traffic has dropped a lot think it is as a result of Penguin where it can also be a result of Panda. Of, the last one we’ll mention is Pigeon. This was released on 24th July 2014 and had a heavy impact on local businesses and how they ranked Google. This is still in a lot of ways in it’s early days and expect to notice more around this in the future. So those the 3 animals to be aware of and as they ‘Roll Out’ an algorithm change you can see if your site has been impacted or not. So rolling out means they make a change to the algorithm (like when you upgrade software with new features). As I just mentioned, this is the best time to see if you’ve been impacted or on the flip side you can look at the historical traffic (that comes from Google) to your website and see if there are any great drops in traffic. This is usually a good tell tale sign that you’ve been impacted. The best way to measure this is through ‘Google Analytics’ where you can drill down and see traffic from the search engines. Now, the best way to see what penalty you’ve been affected by is to take the drop in traffic you’ve experienced and to compare it to the dates Google have rolled out updates. You can do this by Googling ‘Moz Algorithm Change History’, or check out the link I’ve included below. In both examples I mentioned just now, these sites drop in search engine visibility were as a result of Panda updates, so it’s important to understand why before you react or ‘do’. Ok, we’ve covered a lot already so lets cover off the last section before we wrap up… What do you do if you’ve been impacted by a Penalty? First step is to understand what that penalty is by using the technique I mentioned just now. Once you understand the type of penalty from there it’s time to react. In my opinion, I think you should contact a company that can help you strategize and correct the issues. I am biased as this is a service I offer, but I know the complexity associated with getting a site back into the search engines. I have also seen the result of a person trying to correct the issues by digging deeper holes by using old school SEO methods. Let’s say you don’t want to get someone else to do it and you want to tackle it yourself, I’ll touch briefly on what I would do and then we’ll finish up. Warning… if you don’t have a great deal of knowledge around this subject I am about to get technical. Ok, if you find you’re impacted by Penguin you need to clean up your low quality links. You can use software like Link Detox to flag the low quality links and then you need to contact the webmaster of where the links are located and ask them to remove. You should also look at the remaining links you have pointing back to the site and the anchor text they use. If they are too keyword stuffed (meaning keywords you want to rank for is the anchor text you’re using) then you need to change them and focus more on brand links. Next, you need to look at other strategies to naturally attract links to your site. This can be relationships you form where you create valuable content for them, referencing a page on your website that expands on a topic and many, many other ways of getting links. Finally, you should look at how your site is structured and any opportunities to expand on the content of your site, really focussing on how you can deliver value to the end user. Ok, if it’s Panda you should look at the content on your site. Is it original, does it offer value, does it delve deep on a subject, does it link to other supporting content on that subject. If you’re a shopping cart, are you offering an interactive experience? Do you have reviews of your products, allow others to rate and review, do you have supporting content that expands on the back story of your products, do you have suggest other similar products. Panda is all about making sure you are delivering the best experience to your users and as a result of offering that great experience you’ll naturally gain higher rankings. In other words focus on your users first and you’ll be rewarded second. Ok, great. in the next video we’re going to talk about redesigning a website and the areas to be mindful of from an SEO perspective. I’ve witnessed so many sites firsthand that have redesigned their websites have flicked the switch and have totally dropped out of existence as they didn’t cover the basics to make sure all of their previous work gets counted.